← Photo vs film? How do you see your congregation? 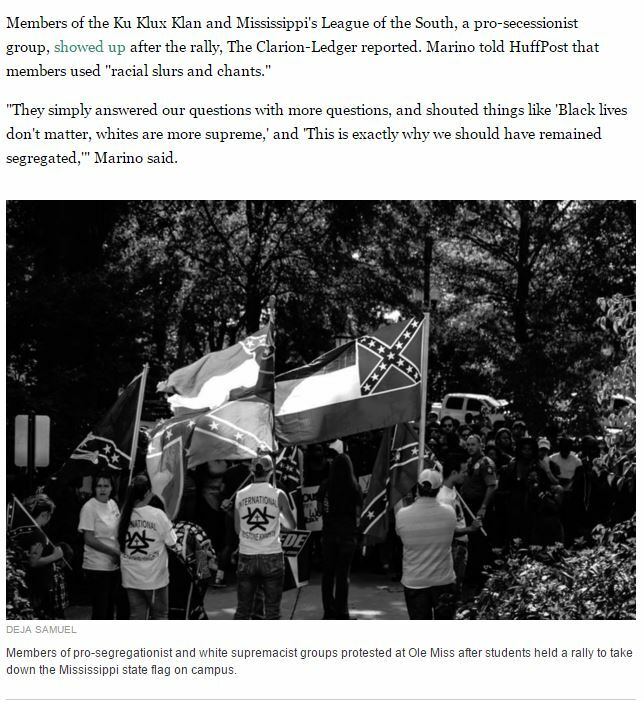 This screen capture is from a Huffington Post article about the rally held at Ole Miss, two days ago, after the student body called to remove the state flag of Mississippi (far right in the picture). Click here for article. Yes, you read that right. A “pro-secessionist” group. They still exist. Every time the Confederate Flag comes up, I find myself trying to explain to my fellow white people why there is a problem with it. I am a white guy, who was raised in the Deep South. So you might see me as an unlikely anti-flag person. But having moved to “the North” (Most think of it as the Mid-west), I find white people’s ignorance of the issue here, even more troubling than those non-ignorant (but racist) proponents of the flag in the South. First off, what we call today the “Confederate Flag” for the majority of the war was not the flag of the Confederacy. In fact, it was the Battle Flag of the Army of Northern Virginia. It later grew in popularity (due to the popularity of that particular unit) and was adopted elsewhere, and only briefly was on the last of several flags of the Confederate States of America. In reality, it hardly ever flew over the South. It’s addition to other flags, such as state flags of Mississippi and Georgia, would not come until much later and was done very intentionally by racists to show that they could still hold power over African Americans. This often delves into an argument about what the Civil War was really over. Let me go ahead and tell you that the only state’s rights at issue were the right to have slaves and the right to have your escaped slaves returned from non-slave states. So don’t say “state’s rights” is different from slavery. If you don’t think the Civil War was about slavery, go read the secession statements of each of the states that joined the Confederacy. Apparently, those guys thought it was about slavery. Here is the funny thing about flags. They are social constructs. They have no intrinsic meaning despite the best efforts of flag aficionados. They are symbols that get their meaning from how, when, and where they are used. So no one individual gets to decide what they mean. The masses get to decide. And you have been outvoted. This is followed by one of two things: a surprising few admit they are racist and out comes a series of expletives and derisive words for people of color and people “like me.” (Which always seems to then somehow resort back to accusations about my patriotism and religious beliefs although I don’t see the correlation.) More often though, it results in them huffing and puffing and scoffing away, which I consider a win. Because somewhere, deep down, they realized, I just might be right. And I realized they may not be a total idiot after all which makes it a win-win. If you really want to talk about pride or heritage in the context of the Civil War, why would you not take the side of the North? You know, the people who saw a great wrong being done and acted against it. Why would you not fly the battle flag of a Northern unit? There were many highly decorated and courageous ones. Maybe one from your state? Maybe one your ancestors actually fought under?